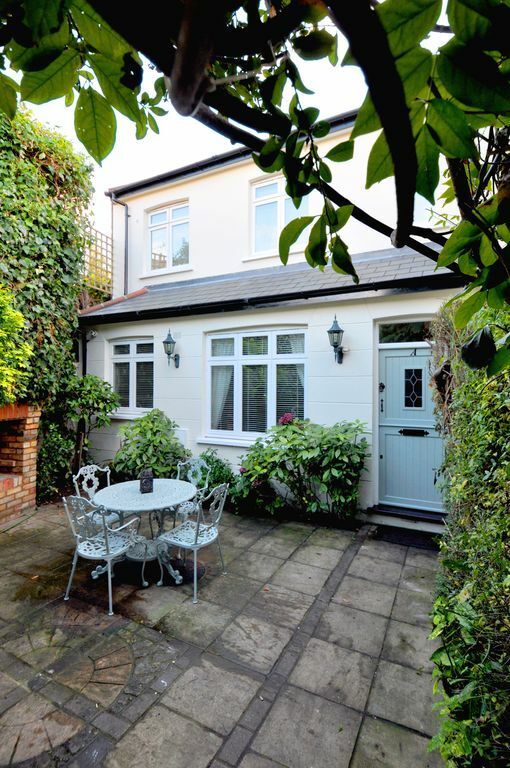 Ivy cottage is located within Zone2 in the leafy desirable central suburb of Putney. Boasting a host of mainline, tube, bus and boat links making for a choice of easy quick access in and around London. The cottage is tucked away within a peaceful gated courtyard and includes it’s own parking space and private patio. Locally you will find everything you need within a few mins walk every style of restaurant, cosy pubs, bars, retailers (some open late) ask our host or peek at our guide book. Tucked away down a private driveway, you’ll come to a gated residential courtyard. Walk through the clock tower arch and you’ll find Ivy cottage is nestled into one corner with its own patio garden. On the ground floor you will find the lounge with comfortable sofas, a coffee table and a writing desk leading to a kitchen diner with seating for 4 people. The kitchen has a washer/dryer, dishwasher and a fridge/freezer. We provide a few essentials to get you through till the next day so you don’t have to worry about needing to shop as soon as you arrive. Upstairs in the main bedroom you will find a double bed with fresh bedding and built in wardrobe with hangers. In the second bedroom you will find another double bed with fresh bedding and wardrobe with hangers. The bathroom has a large walk in shower. Provided are clean towels and bathroom essentials again enough so you don’t have to worry about shopping till the following day. The house also comes with free Wi-Fi, Cafetiere (coffee press), iron and hair dryer. And as mentioned fresh towel and bedding along with enough essentials to see you through your first night. Some trivia of the courtyard it was home to Holdsworth Bicycle manufacture from the 1930s before they moved and it became a printing factory. When the courtyard was bought in the mid-nineties it was converted into 4 mews houses and 2 single storey apartments. Myself Simon will be there to help you manage your booking. Barbara manages the properties and takes over from me as your point of contact once you arrive. We have both have a vast depth of knowledge of the area and going into London having lived in Putney and the surrounding areas most of our lives. We are a family business was established in 1987 in focusing on property development, we started to build portfolio of rental properties since 1992. Excellent property, position, and hosts. We would recommend without any hesitation. This is our second stay at the Courtyard and enjoyed it every bit as much as our first stay. We stayed in IVY cottage Putney for over a week and had a lovely time. Simon, Barbara and co were very helpful and accommodating including storaging luggage for a late flight. The property size suited my small family and the location was just perfect. We had a few very minor issues: Storage in Kitchen was lacking, cleanliness of the property was not 100% as there was stains on the wall around the kitchen and bins, kitchen ware was a bit old, stained and crockery pieces were from different sets and some items (ie fans and desk lights) in the bedrooms were redundant. But overall these not concerning and we had a fine time. Fantastic location and perfect little place to call home while we visited London. We loved our stay in Ivy Cottage in Quill Lane. Tom and Barbara were very helpful and the location suited us being near the High Street, British Rail, tube and buses 14 and 22. Cottage is well equipped even with a washing machine. We will definitely stay here next time we visit London. Putney and also brilliant for visiting London and also Chessington. recommending Ivy Cottage to anyone. Also the arrival pack is very useful. a visit to London then this is the place to stay.